Diabetes Prevention Program is Starting Soon! 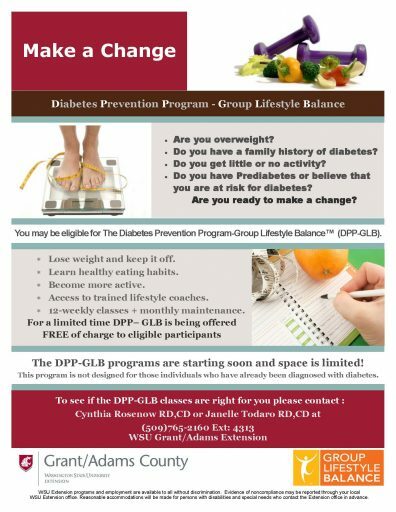 We are currently looking for participants for the Diabetes Prevention Program – Group Lifestyle Balance (DPP-GLB). Participants need to be at risk for diabetes or be diagnosed with Prediabetes to qualify for this program. Call our staff today to complete a very short Diabetes Risk Assessment Quiz. To register for our next series of classes or for more information contact Cynthia Rosenow at WSU Grant Adams Extension. 509-765-2160 Ext. 4313 or 509754-2011 Ext. 4313.